Simone Hearn is facing many challenges: the 24-year-old single mom of the three small children is battling stage 3 breast cancer and has been living with a relative in a home with no lights or electricity for months. On the brink of homelessness after her relative’s eviction, Fox 2 News shared her story. 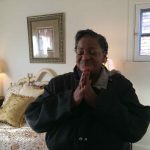 Two weeks later, Working Homes/Working Families has provided the Hearn family with a new home, and a stocked refrigerator.